TOOTHBARS ARE CURRENTLY RUNNING A 10 BUSINESS DAY LEAD TIME BEFORE SHIPPING. WE APOLOGIZE FOR ANY INCONVENIENCE. 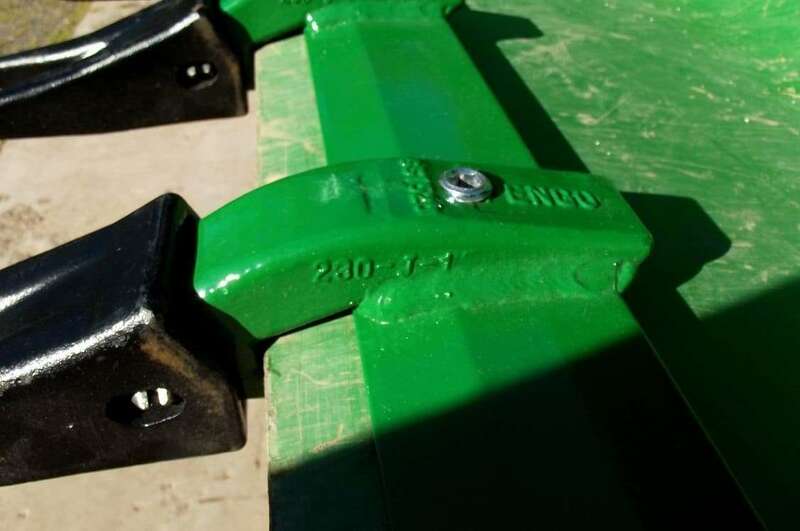 The Heavy Hitch Bucket Tooth Bar is the heavy duty tool you need to increase your bucket capacity and improve digging performance. Clamp on tooth bar installs simply with 5/8″ set screws in each tooth shank. All you need is a 5/16′ Allen wrench to install. 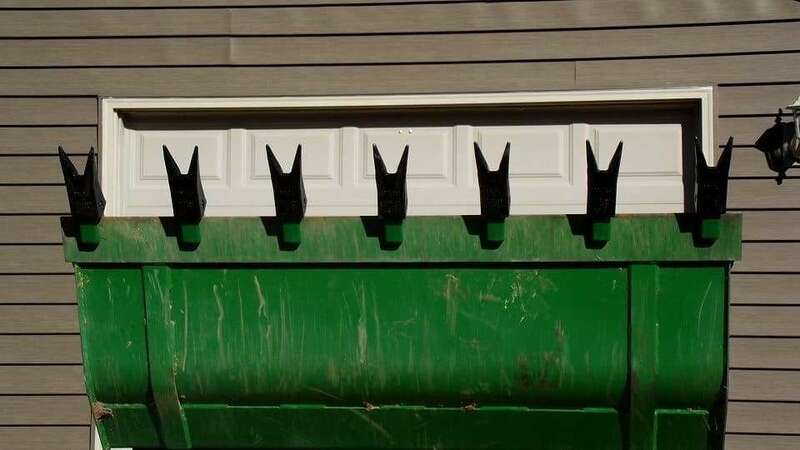 49”, 53” and 61” buckets on John Deere models 45, 120R, H120, D120, H130, D160, H160, H165, 200CX and 300CX front end loader buckets. 57” bucket on John Deere 220R model loaders with standard or heavy duty material bucket. John Deere heavy duty 61″ and 73″ toothbar also available. If your cutter edge has holes running horizontally across it, the 61″ or 73″ HD is the model you would want. It will bolt on using a number of holes in the cutting edge. If you’re unsure of fitment, call us at 1-888-337-8999. Comes standard with a super durable finish in your choice of John Deere Green -G, Black -B, or Kubota Orange -O environmentally friendly powdercoat. Select color and size when ordering. Features heavy duty Pengo 230 shanks (with ⅝ inch cup-point set screw); 6 shanks on the 46″ and 49″; 7 on the 53″, 57″ and 61″; 8 on the 73″ toothbar. Teeth are replaceable and interchangeable. Installation is easy – no drilling required. Simply slide on and tighten set screws to 35-40 foot pounds using a 5/16″ Allen wrench. Works with standard material buckets with up to a 1/2″ cutter bar. Smooth design prevents mud and debris from hanging on. 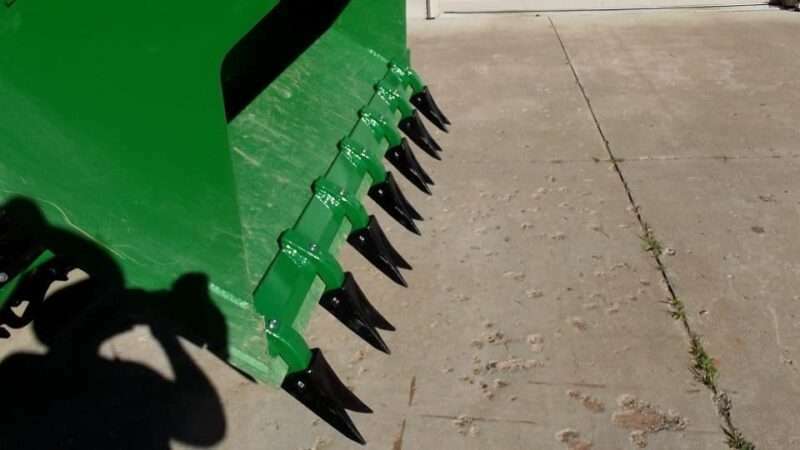 Custom bucket tooth bar options are available for other size buckets and cutting edges. Contact us to start a custom order. This bucket tooth bar will not work with a heavy duty bucket and ¾” cutter bar. Please call us at 1-888-337-8999 or email us for help selecting another model that will work with your specific tractor. Great Job on this Toothbar, it is out of this world! digs great, no problem to install, great job! should of got code from youtube for 5% off. called the dealer few times and email them asking where it’s at !! he said he kept getting excuses from heavy hitch ! so asked them to ship it directly to me in June30 still haven’t received it !! I’m sorry to hear about your frustration with not being able to get a toothbar from your dealer. I personally contacted the dealer when I received your comment and offered to ship the toothbar directly to you for free, but we had to get the order from the dealer first. Once we received the order from the dealer we shipped the toothbar out the next day to you. This is the very first poor review we’ve received in 8 years of business and I hope once you receive the toothbar, you’ll comment on the product itself and not the poor experience you had with the dealer. I ordered my toothbar for my 2017 John Deere 2038R a month or so ago. Received it very quickly. It is built like a tank. The screws are thick and strong. Pregreased so they tightened down easily. Turns my little tractor into a digging machine! Not only does it cut thru dirt easily, but it is great for those basketball size and bigger rocks you unearth from time to time. Just place a tooth underneath it and roll your bucket back. Flops them right out. Love this thing! Great product packed well and shipped fast w/ tracking. Wow! I ordered this for my John Deere 1025R about a month ago and received it within 2 weeks, but didn’t have the chance to use it until this past weekend. What a amazing addition to my tractor! I’m extremely pleased with they way it cut into sod and dug right into the ground. I can’t wait for the next project to use it again. Thank you for making such a fantastic product! Fantastic product! If you have a bucket you need a tooth bar. 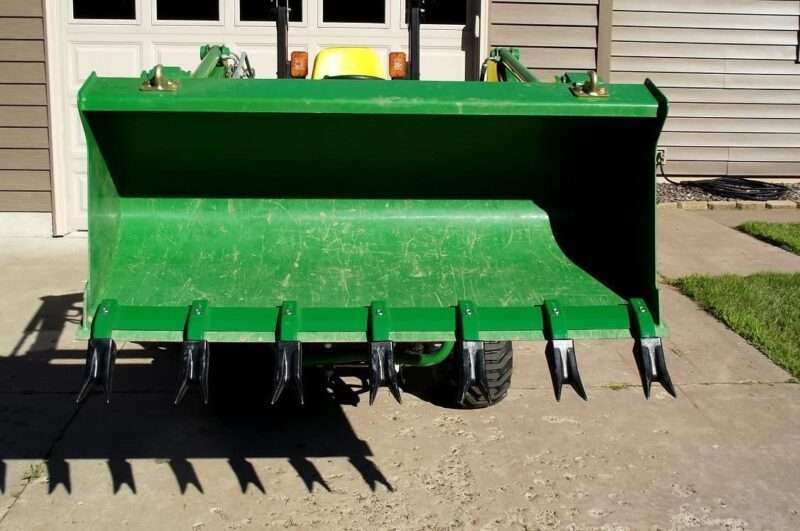 I ordered a 53″ tooth bar for my John Deere 1025R and it is better than I anticipated! This is a “must have” if you intend to do any digging in a grassy or root invested area. Simple to put on when it is needed and easy to take off. And, as someone else noted, it is built like a tank! great piece of equipment, quality material and craftsmanship. i already had a tooth bar on my bucket but liked the way this one got down and worked with roots and stumps. easy installation. worked well. quick delivery. i’d recommend and buy again. you have to have this one available when you need it. 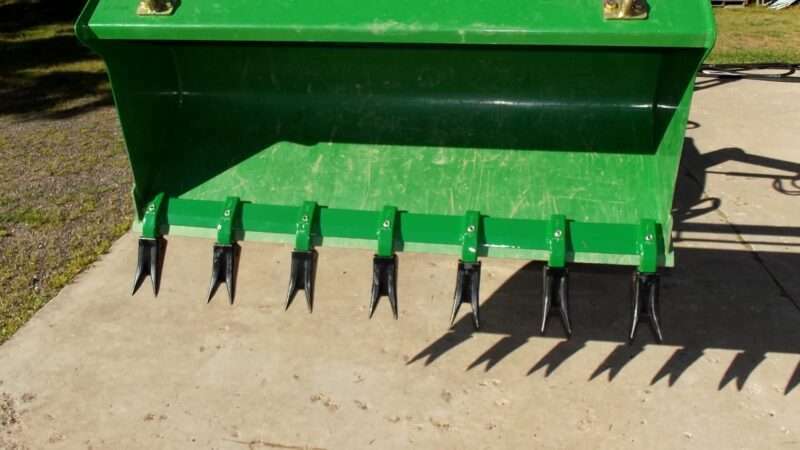 I ordered my 61″ tooth bar for a 2017 John Deere 3025e and paid extra for expediting. My order was processed in one business day and I received it in 4 days just in time for work I needed to do the next weekend. I knew there would be some improvement in the overall use of my bucket, but I did not expect it to work as well as it did. On its first use, I was able to unearth two large stumps in my yard in 45 minutes. This will be a game changer for my farm. On top of this, along with the shipment came a magnet that including a cell phone number for Greg. I had a quick question, so I thought, “What the heck, I try to call the number.” I fully expected to reach Greg’s voicemail box, but no, he answered my call live and handled my question right there on the spot. That is great customer service! Thanks for a great product and timely service. I would highly recommend this purchase and company to anyone. Are you kidding me! This Tooth Bar is amazing! I’ve had my eye on tooth bars for a couple of years for my J.D. 2025R thinking that they have their place but wouldn’t be highly used. Boy! was I wrong! After getting approval from my arborist (He had sprayed invasive plants earlier in the season) to clear out the last section of my apple orchard that had been taken over by woods I knew I had my work cut out for me. Snow was not that far away so I ordered the 61″ tooth bar with expedited shipping. I got the darn thing the day before. Kidding, but it was fast. I mounted it the day after I received it and spent the next 3 days clearing brush, my planned use. But then I found that it could take care of the saplings that were too large for my brush hog. I was digging up trees left and right and then carrying them off with the tooth bar. Managing my growing brush pile was a breeze as I could easily scoop up loose pieces around the edges and raise it at the same time. 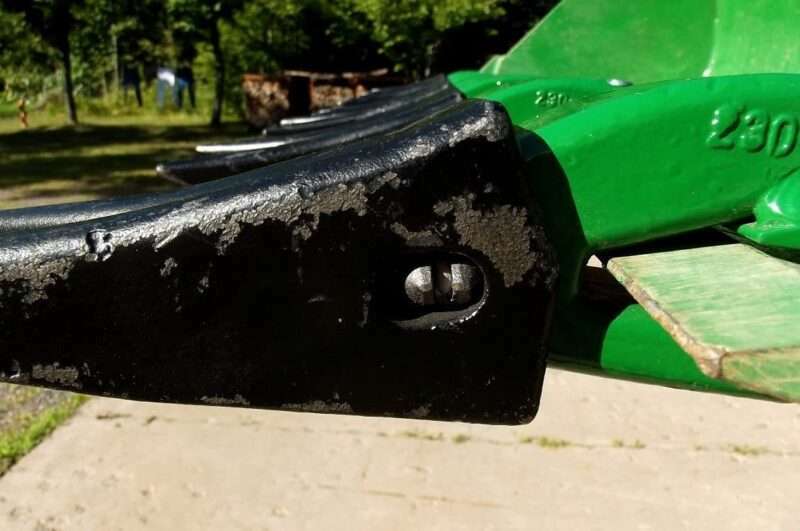 I think that that the Heavy Hitch tooth bar increases the usefulness of any tractor and should be standard equipment on all tractors. I wish I had bought this one 2 yrs ago! 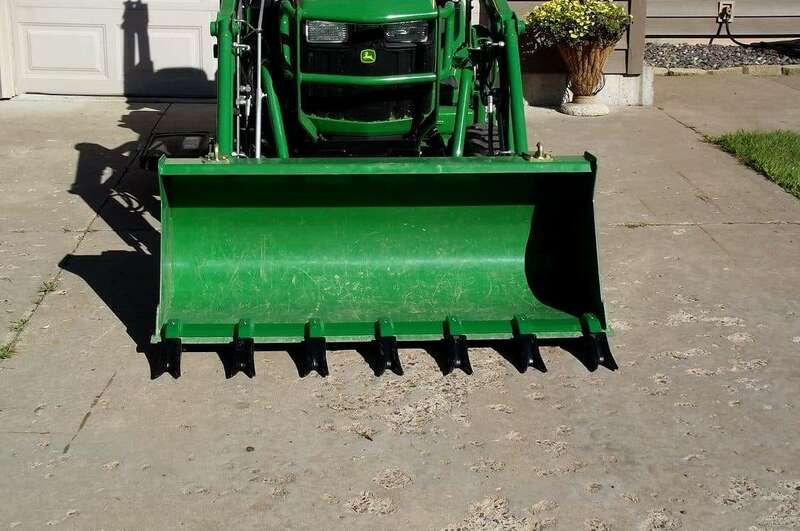 i ordered the 53 inch tooth bar for my 53 inch John Deere bucket. The ordered was delivered on time and in good shape. It took me about 15 minutes to put it on. It would have been quicker if I had not taken the set screws out to grease them and then melting wax into the hex head once they were tightened in case I wanted to take it off. The tooth bar is vert sturdy and I am looking forward to using the bar with this tooth design. I am very satisfied with my purchase. Works perfect, heavy duty. No drilling on the bucket and easy clamp on. Strongly recommend and I never leave reviews for products but will for this one. 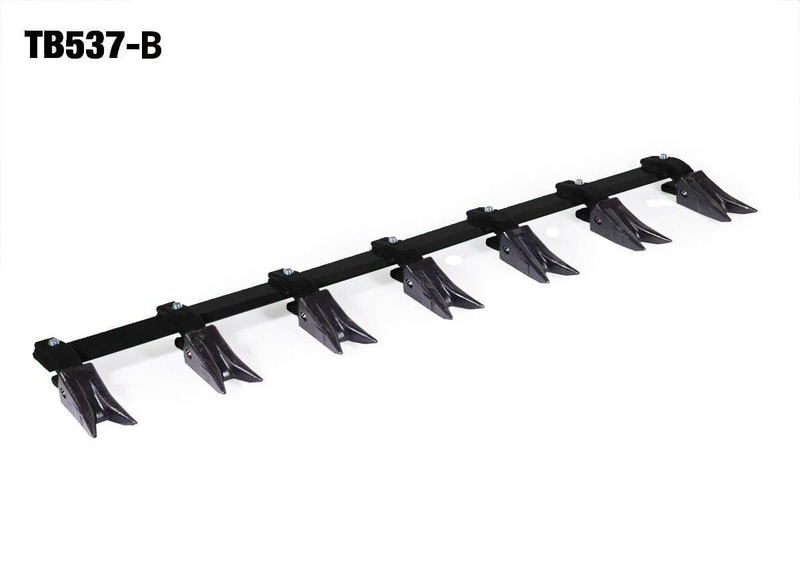 Ordered the 49″ Toothbar for my JD1025R. Wow, easy installation and great quality! Removed three tree stumps, one tree and two bushes before noontime! just installed my tooth bar on my JD x700 2wheel drive tractor. INCREDIBLE difference to dig dirt. very glad I bought it. You’ll need to measure the inside width of your bucket and then select the size that is closest to that width. I have had my Tooth bar for about 4 months. What a difference this thing makes on your loader. My loader will actually dig for the first time. My money was well spent for this attachment. Good quality and very easy to install. this will tear into and dig into just about anything. easy and simple to attach/install onto the bucket. rugged, durable, heavy duty. well invested product. be nit-picky is those teeth will sneak up and trip you if you are not looking. lol. overall there is nothing wrong with this product. any problems that do arise. greg will call even a little after close of business hours to help customer.